Are Blue Whales Singing A Warning Song? 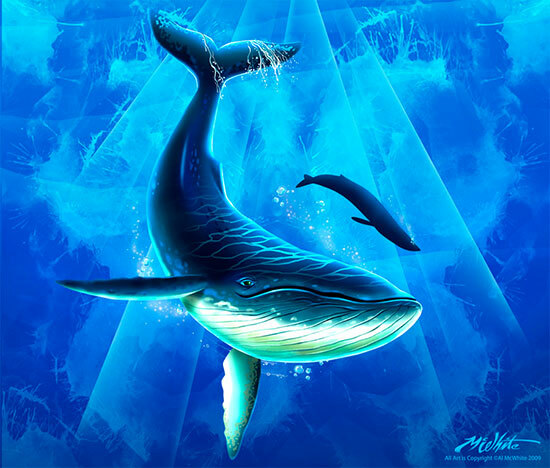 There has been a strange phenomenon occurring among the giant blue whales throughout the oceans of the world. Their songs are changing, and the modulation, which involves a reduction of pitch to lower and lower hertz, is global in scale. Mark McDonald, president of Whale Acoustics, which specializes in the sonic monitoring of the whales, said the change was first noticed in about 2001. He said his team began having to re-calibrate the automated song detectors they used to track the blue whales off the California coast. The detectors have had to be re-calibrated to lower and lower levels every year since, McDonald said. A report in the October issue of Endangered Species Research, by oceanographic researchers Sarah Melnick and John Hildebrand, notes that the phenomenon has been occurring everywhere in the world. The scientists say they cannot explain it. They suggest it may be a reaction to increasing noise pollution in the oceans from submarine sonar and other military technology. But the shamanic elders of the Siberian Yupik peoples, on Russia’s far eastern Chukchi Peninsula, are saying the whales are sounding a warning. We all know that the Mayan Calendar's date came and passed without noticeable changes occurring in the world. But change has been happening. Humanity now finds itself caught up in a chaotic environment of conflicting politics, an escalating toxic environment, a loss of safe drinking water, and a heating planet caused by the reckless burning of carbon based fuels. Efforts to organize frenzied crowds to work together to change course appear to be fruitless. Consequently many researchers are warning that the complete analyation of life may be just around the corner. Is this the message the blue whales are delivering?